I wanted to make a cake for my friend who has a birthday on Halloween. I have made her a Halloween cake before but this time I wanted to do something that was not going to be so predictable that tied in with the holiday. So I thought about her other interests and thought Vegas Baby! Would be a great idea for her, as she has been to Vegas many times and loves it there. So my inspiration for the creativity of the Vegas birthday cake came directly from the casinos. I thought I would bring a little bit of Vegas to her! So, here it is! 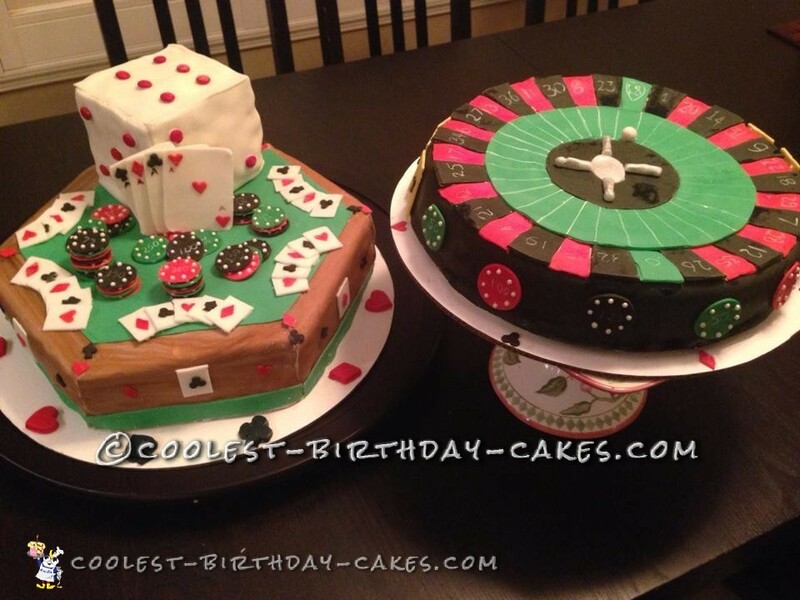 A roulette table with the winning ball on her age, a blackjack table and a dice sitting on top of the blackjack table. This took about 15 hours to make. I made sponge cakes then covered them all with fondant, and used different food coloring to achieve the correct color. I then looked up the order of the numbers for the roulette table to make it look authentic. Each chip has pearly balls that took forever to do. It was so much fun to make and I was very pleased with the outcome. My friend loved it and all her family and friends loved it too. I loved it when my friend cut into it, but of course it took only a few minutes to eat and thought about all the hours it took to make! I would say the most fun is looking at the finished product and hearing everyone say how well it came out, as then I was pleased. The hardest part was trying to size up all the red and black tiles on the roulette table, also my pet peeve is covering the cakes with fondant. The fiddliest thing was putting the little pearly balls on each chip. All in all, I am pleased with the overall outcome. If I was to make it again, it would probably take a lot less time as a lot of the time, goes into thinking about how to do things! Enjoy!